The Eye of Horus and The Eye of Ra: What’s the Difference? What is the meaning of the Eye of Horus tattoo? The eye of Horus is worn to gain protection against evil, it symbolizes the power of light against dark. In Ancient Egypt, It was often used as an amulet, to gain protection in the afterworld. This is a talisman for Health, Power, and Protection. The eye represents the cosmic unit, the one that unifies all creation, beyond the capacity of human senses. This Egyptian symbol has the intention of awakening the desire to find God and the cosmic unity he/she belongs to. The pendants with the “Eye of Horus” symbol are wonderfully designed and they are made of tin-copper alloy, gold or silver, embellished with Swarovski crystals. 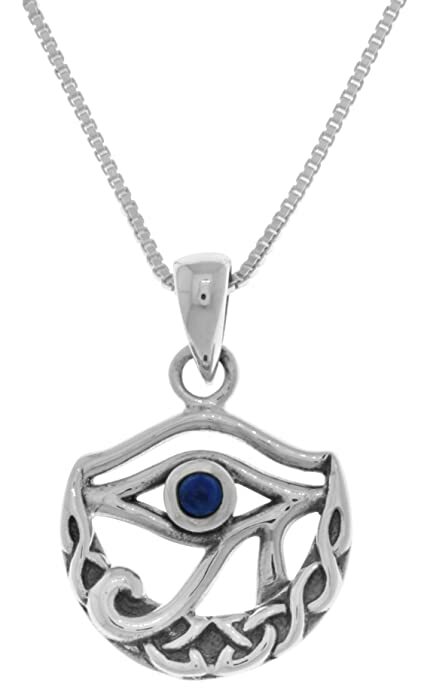 The beautiful semi-precious stone of Lapis Lazuli is perfect for the Eye of Horus talisman. On one hand, it represents the friendship and the communion between the human spirit of everyone and the esoteric, divine spirit of Horus. In the same time, the same Lapis Lazuli is the stone of healing, used across history by quacks, shamans, and medics in the Western Middle Ages, to help close emotional and physical wounds. Even in the present times, the seers are still believing in the power of this stone of facilitating clairvoyance and bring love into the life of those who are seeking their help. 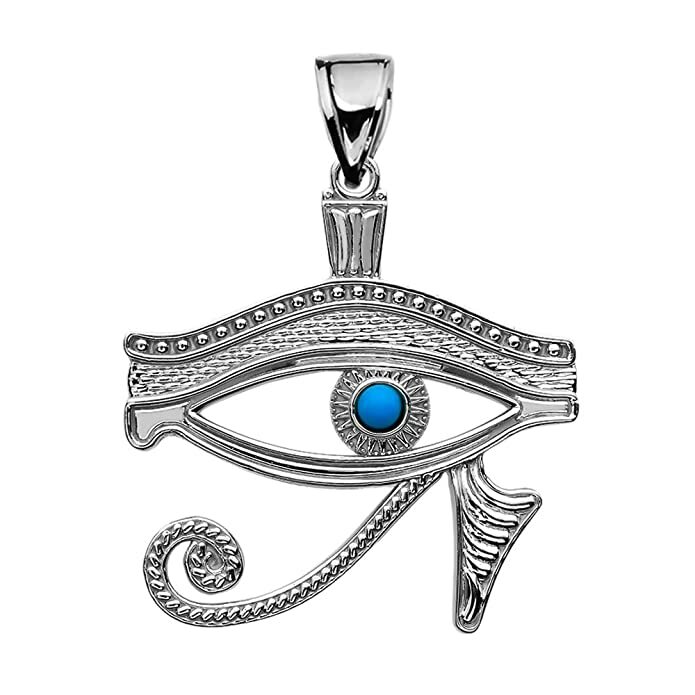 It is probably the most suitable stone for an Eye of Horus pendant. The legend says that the Eye of Horus, which Horus lost when fighting Seth, but which Thoth gave back, is also called the Eye of God. It is a popular remedy symbolizing both the sun and the moon. It protects against the evil eye – in the same manner evil eye remedies usually do – by turning the spell back to where it came from. It protects its owner against all evils, making him invulnerable. The remedy helps its master raise above any hardship and heal in case of sickness. The pharaohs used to wear rings with the Eye of God, being thus connected to the world of gods. 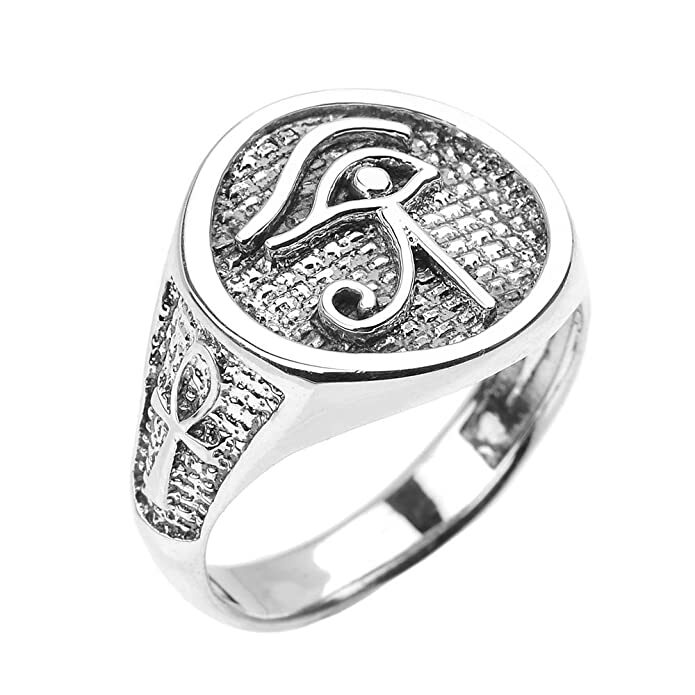 The eye of Horus ring is an Egyptian symbol that brings protection, wisdom and offers to its bearer clarity and lucidity. Horus is one of the most worshipped deities of the polytheistic religion from Ancient Egypt. There are many myths about his birth, and the most famous one has a significant dose of violence. Horus is the son of goddess Isis and Egyptian god Osiris. He was born after his mother, furious and desolate, gathered all the body parts of her deceased husband, she reassembled them and used her magical powers to fashion a golden phallus, which she used to create Horus. Once she found out she will give birth to Horus, Isis run away from the Nile Delta, to escape Seth’s threat, his brother, who killed Osiris and whose next certain victim would have been her unborn son. Coming into this world, Horus became, successively, the sky god, the god of hunting and the one who defeated Seth. The uncle and the nephew, both having divine origins, fought many times, and, finally, Horus won against Seth when racing in boats made of stone. Seth participated with a boat made of rock, while Horus cheated and painted his wooden boat to resemble a stone boat. Since the ancient times, about the eye of Horus, also known as Wedjat, it has been said that is a strong protection symbol and that it can bring wisdom to those who wear it. This third eye, a divine eye, grants its bearer unparalleled lucidity and clarity to the eye of the mind. It is said that if you use its powers, you can accomplish any goal, whether is a fast enrichment, true love or inner peace. Its legend originates from Horus’s temporary blindness, which he suffered after a confrontation. Just as the god managed, in the end, to regain his sight, his eye is a symbol of those who prevail by fair means or foul. According to mythology, the right eye of the Falcon God, Horus, represents the Sun God, Ra, and his mirrored imagine (the left eye), represents the Moon and the God of Magic, known as Tehuti or Thoth. The right eye of Horus represents the concrete information, controlled by the left hemisphere of the brain. It governs words, letters, numbers and those things that are described in terms of sentences and full thoughts. The right eye is a transposition of the universe from a masculine perspective. The left eye of Horus represents the esthetic, abstract information, controlled by the right hemisphere of the brain. It deals with thoughts, esoteric feelings and it is responsible for intuitions. It is a transposition of the whole universe from the point of view of the feminine orientation. Taste– from the stem planted at the beginning will rise an offshoot, which feeds the spirit and the body of the human being. 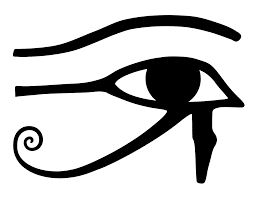 Thinking – the ‘eyebrow’ of Horus’s eye symbolizes the gesture of raising the eyebrows while thinking. Smell – the inner corner of the eye, traced as a determined arrow, explains the importance of perception in forming opinions about the world and sharpening the extrasensory perception, of which any of us can dispose. Sight – the magic eye pupil refers to the capacity of seeing the world from a new perspective, due to the wisdom and clairvoyance granted by Horus. Hearing – a part of the symbol of Horus’s eye has the shape of a funnel, or a horn or an ear, to symbolize all the sounds and the sound landscapes of life, which relax us or, on the contrary, aggravate us. The Sun is considered the eye that sees everything, it is the opening through which the light is emitted and it allows all things to be illuminated. Symbolistic, when put side by side, the eye and the sun are synonyms. Very often, the eye of Horus can be found on funerary objects – the eye that opens and shines like a sunray, leading the soul in its journey beyond death. The explanations are different! Some say that, in fact, the tear is the result of a cerebrovascular accident, caused by the Egyptian god, Seth. The two gods fought for Osiris’s throne. Allegedly, Seth caught his eye and took it out, in its place remaining that tear shaped trace. Thoth, the god of harmony and balance, set Horus eye back, but the wound below the eye remained as a scar to remind the Egyptians the essence of “fair play”. Another opinion is that the tear imitates the marking around the eye of a falcon. This is logical because the traveling falcon was a sacred animal for Horus. The falcon is also a solar animal – associated with the sun, it is said that it can see everything from the high sky. Alongside the falcon, the snake was another sacred animal, but not just any kind of snake. The spiral from with Egyptian sign of Horus’s eye represents Uraeus, a spitting fire snake that protected Horus, Ra. Uraeus is a female snake, associated with the cobra. The cobra is a sacred symbol in Egyptian wisdom, with the power to give and take life. This symbolism is probably due to the poisonous venom of the cobra. When mixed, these elements create a very strong symbol. It is no wonder that in the present there are so many amulets and jewels with the eye of Horus – this being an omnipresent symbol of power, protection, and illumination. The eye of Ra is an Antic Egyptian symbol, signifying protection, health, and royalty. Over the course of the years, thousands of people had it tattooed. Let’ continue with few of the meanings of this symbol. Those who choose such a tattoo think that the eye will watch over them and protect them against negative energies, bad things, illness and so on. The tattoo representing this symbol is usually placed on the back, neck or shoulders. Although it looks best in its simple form, some are stylizing and customizing it, to look more in trend or to better reflect their personalities etc. It is said that the “All-seeing Eye” brings luck and prosperity to the woman who wears it, offering her wisdom and protection against sickness and enemies. In our times, this is a very popular tattoo because it looks good and is a talisman, but it can also represent a person who is dear to you, who’s always been next to you, protecting you (for example, your mother); it can also signify inner strength, the ability to see beyond appearances or some kind of guidance.